Do you feel trapped when it comes to Lakeway garage door repair? 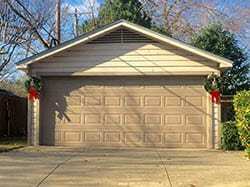 Perhaps you don’t know where to turn and who to trust for your garage door service in Lakeway. The good news is you have Action Garage Doors on your side. When you want the best in garage door repair in Lakeway, you have to turn to the best. For years, we have been providing residents all over Lakeway with the garage door service they need to have their garages in the best working order. As a garage door repair company that is committed to customer satisfaction, nobody beats Action Garage Door. Our family-owned business has been satisfying customers for 30 years and we are waiting to help you find the services you need for your garage door in Lakeway. All our work is always up to code and our products can stand up to the elements for years. At Action Garage Door, we understand you have many needs when it comes to garage door service. For this reason, our garage door service goes way beyond simple repairs. We can install a new door or garage door opener, get your door back on its tracks, or simply make it safer. We can handle whatever type of problem you may be experiencing with your garage door. No two home or business owners are alike, and our garage door repair company understands that no two will want the exact same garage doors and set up. At Action Garage Door, we offer a variety of garage doors for installation in Lakeway homes and offices. Some of our options include, Carriage House, Olympus, Classica, Stratford/Heritage, and Amarr garage doors. To get started with your garage door repair, installation, or replacement, contact Action Garage Door in Lakeway today and let’s talk about the options available from the garage door repair company that has been caring for customers since 1984. There is little more aggravating than a squeaky garage door that never seems to operate quite right. If yours needs attention, adjustment, repair or complete replacement, call the highly trained experts at Action Garage Door. They’ll respond to your call for help in Lakeway and get the job done right for you — no problem! Lakeway is an affluent suburb of Austin, located in Travis County and best known for its proximity to Lake Travis. Still a small town, Lakeway had a population in 2010 of only slightly over 11,000 people, with about 5,200 household. Median price of homes in the community is $368,000, and approximately 82 percent of the homes are owner occupied. The high price of housing boosts the cost of living index in Lakeway, but actually other costs are pretty much in line with other nearby suburban communities. Healthcare is slightly above the norm, but groceries, oddly enough, are lower than the norm. Median income of owner-occupied residences is $120,313, or 97 percent higher than the national average; the median household income, at $109,628, is 105 percent higher than the national average. Unemployment and poverty rates are substantially lower than national averages. Living in Lakeway allows residents to “escape” from the urban vibe of nearby Austin; and being close to the water and leisure activities are the primary reason the area attracts residents. Lakeway, located 16 miles west of Austin, was spawned by construction of a 48-room hotel begun in 1962. Over the years, the hotel welcomed many well-known guests, including Lady Bird Johnson and Texas Gov. John Connally. Today, the 148-room Lakeway Resort is still in operation. The city was incorporated in 1974. Lakeway Regional Medical Center is designed to serve the city and surrounding communities. Situated on 54 acres, the first portion of the state-of-the-art facility opened in 2012. When complete, the medical complex will include an emergency trauma center with heliport, a hospital that can be expanded to 200 beds, medical office space, an 85-bed rehabilitation center, an elder-care facility, outpatient services, an extended-care hotel and 30,000 square feet of retail and restaurant space as well as parking and nature trails. Living in Lakeway is family-oriented and easy-care, with community events that range from an Easter Eggstravaganza to spring and summer concerts and an indoor garage sale. There are parks and recreation centers, hike and bike trails, greenbelts, ball fields and playgrounds, and plenty of opportunity to get involved in volunteer efforts and local clubs and organizations. The community takes pride in its schools, which include elementaries within the city’s boundaries, middle schools that also serve unincorporated areas and a single high school that serves both. Residents of Lakeway think they live in the prettiest suburb anywhere and they want to keep it that way. If you need landscape design, with plants that will thrive in this part of Texas, be sure to call a local firm like Kevin Wood Landscapes. Great service, Tyler was knowledgeable and professional. Will use this service again if needed. Fast, friendly and great work. Wrong size door ordered by original service person. Installer very good. Caught error before dismantling old door. We have an 18 foot long X 8 feet high garage door. After August 18, 2014 hail damage, the door was replaced by an unnamed company covered by insurance. The equipment was 12 years old. The plastic rollers failed causing problems with the load on the motor. Action (Tyler) was at our home within an hour after receiving our call, replaced the rollers ones with vinyl and returned as scheduled to replace the motor, drive, interior and exterior controls, and car controls. Service was excellent at a reasonable price. The door works perfectly and is quiet. Reinforced garage door. I just said horizontal track and repaired bottom seal.